Find Your Best Shade Below. Need More Help? Click Here For A Complimentary Consultation! Bar none, the BEST way to figure out your perfect foundation color is to use the Fitzpatrick scale. This scale indicates how your skin reacts when exposed to UV light and has 6 different levels, each of which has specific characteristics. Find out which level you are by asking yourself, "How does my skin react when I've been in the sun?" Sometimes, you may find that you fall BETWEEN two levels and that's ok. It simply means you may need to mix 2 different shades of foundation to get your exact match. Or, it can mean that you can get away with wearing a foundation color that fits into one category or the other. The way to know this is to conduct a STRIPE TEST. After you've found your perfect shade match, now you just need to choose your perfect foundation finish! Try our Loose Mineral Foundation or our Créme Mineral Foundation! *We suggest you consider purchasing SAMPLE sizes first before committing to a full-size product. Am I WARM or COOL? The question, "Am I warm or cool?" is probably one of the most frequently asked questions by women when it comes to makeup and wardrobe. Over the years, there's been many myths about how to answer this question, such as looking at the color of the veins on the underside of your forearm. However, there's a reason why a 'myth' is called a 'myth', right? 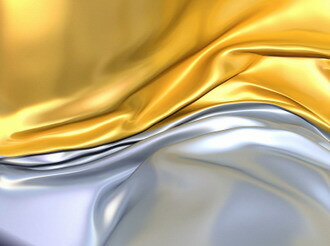 The best way to determine if you are Warm or Cool is by looking at the colors: Gold and Silver. No two colors tell which category you fall in better than these. Pick up a fabric swatch of each color and lay them side by side in NATURAL DAY LIGHT. Don't use incandescent or fluorescent lighting because they change the color of your true skin tone and will render this color test inaccurate. Remove all jewelry from your hands and place one hand on the gold fabric swatch and the other hand on the silver fabric swatch. One hand will look pasty and the other will look healthy and bright. If your hand on the silver swatch looks best, you are cool. If the hand on the gold swatch looks best, you are warm. Please note that this DOES NOT mean that if you're cool, you can never wear warm tones and vice versa. It simply means that in order to pull off warm tones (or cool tones) successfully (without looking pasty & sallow), you'll have to work a little harder with color coordinating and mix up the colors a bit.